This is not the first time that you've seen me wear this little pink jacket on the blog, and I can guarantee you, it won't be the last. There is nothing easier than throwing on a little jacket or blazer to make an outfit look more polished, and that's what this jacket did for my outfit when I wore it this past weekend to celebrate my Grandmother's 90th Birthday. Although I don't normally wear this much color, I felt the occasion called for something bright and cheery. I've owned this floral Yumi Kim tank top for a while, and paired with white jeans and this pink blazer, for a polished look that was grandma approved. Whenever I'm rushing out the door because I'm running late for an appointment (which is every time) and not sure what to wear, I always reach for this jacket as it instantly makes my outfit look put together. Even when I'm dressed in ripped jeans and a tee shirt, adding this jacket and a pair of heels not only make me feel more polished, but it adds a little color to my usually black a grey assembles. What are the items you reach for to make your outfit more polished? 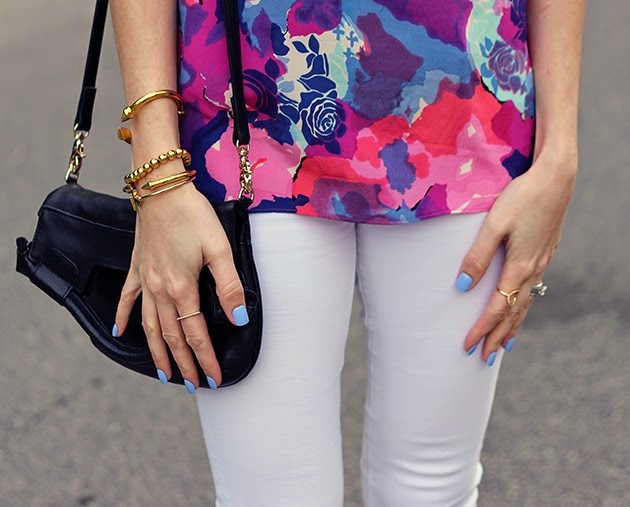 One reason I love white jeans so much is because they look so great with color. They are the perfect choice for your great pink jacket!